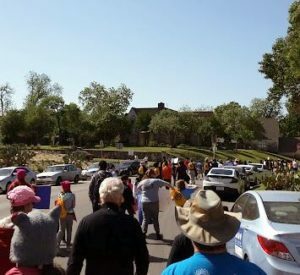 On April 14, 2018, San Antonio held its second annual March for Science. The 2017 march wasn’t as well attended as I would have liked and the 2018 march had, from what I could tell, even fewer people. I haven’t yet been able to find any official numbers of attendees for this year, though. Some of the marchers. You can probably see what I mean about the sparse attendance. We started out at Thomas Jefferson High School, the third-oldest high school in the city (the first two were evidently the Main Avenue High School (which is where CAST Tech High School is today) and Brackenridge High School (which is on Eagleland in between St. Mary’s and the San Antonio River)). A large number of famous San Antonians attended Jefferson High School including the Castro brothers — Joaquin (a US Senator) and Julian (the former mayor and who was Obama’s HUD secretary) and two Nobel laureates — Robert Floyd Curl, Jr (namesake of Floyd Curl Drive in the Medical Center area? Perhaps) and William E. Moerner. Jefferson High School has a lovely building, which is on the National Register of Historic Places. Jefferson High School. I actually like this one pretty well. The opening remarks were given by Ron Nirenberg, the current mayor, and then we marched down to Woodlawn Lake Park, sort of buzzed the park a bit, and then back to the high school. The march didn’t get much attention in the media, so only a couple of people came out to watch us (we also were watched by, and waved at, some roofers who were working on one of the houses in our path). I listened to the speech by the faculty sponsor for the Motorsport team, took some pictures of the building, and then hung around until I started to see people leave. It was a very enjoyable march. It’s nice to get out with people who share the kinds of interests that I have. I just wish that there had been more promotion of the actual march, so that more people would have turned out for it and maybe we would’ve gotten more spectators. *They won first place in a design award and fourth in the actual race.